Haywood, K. M., Allen, K. R., & Myers, F. A. (2016). Client-based dissertations in practice. In P. Blessinger & D. Stockley (Eds. ), Emerging Directions in Doctoral Education. Innovations in Higher Education Teaching and Learning (Vol. 6, pp. 171-188). Bingley, U.K.: Emerald Group Publishing Limited. Science communication, as a hybrid, involves the concomitant reading of graphical representations and natural language. A scientifically literate individual should be able to make sense of both sites of information in relation to one another. In this paper, we explore the ability of 61 students from a highly rated, all-girls Catholic School to make sense of inconsistent graphical and textual data and examine their interpretations within 3 distinct settings: individually on a paper assessment, in a one-to-one interview with the researchers, and through classroom conversation. This study indicates that (1) sense-making was difficult for even advanced students and (2) different interpretations of text evolved within each of the 3 settings. Many students initially privileged natural language over the data represented on the graph and sought ways to explain how the incorrect description could somehow be construed as accurate. Although these students could successfully complete school assignments related to graphs, their skills in reading authentic, real-world science communication was limited. We recommend that teachers invite discussion of various semiotic forms rather than scaffold for correctness. Students have learned to do schoolwork, but they are much less able to engage critically in real-world science. M. Wolf, F. Grodzinsky, and K. Miller. There’s something in your eye: Ethical implications of augmented visual field devices. Journal of Information, Communications & Ethics in Society. Forthcoming. B. Spielman, J. Craig, C. Gorka, and K. Miller. Case complexity and quality attestation for clinical ethics consultants, Journal of Clinical Ethics, Vol. 26, No. 3 (2015), 231-240. F. Grodzinsky, K. Miller, and M. Wolf. Developing automated deceptions and the impact on trust. Philosophy & Technology. Vol. 28, No. 1 (2015), 91-105. K. Miller. Kids, Coding, and Cognition. Talk at the 15th International Postgraduate Research Conference (7 March 2016), St. Louis, MO. B. Brinkman, D. Gotterbarn, and K. Miller. Integrating Computing Ethics and Professionalism into the Technical Curriculum. Workshop at the Special Interest Group on Computer Science Education Technical Symposium (2 March 2016), Memphis, TN. K. Seigfried-Spellar, R. Gilliland, J. Dibble, M. Losavio, K. Miller, M. Rogers, A. Skjellum. Workshop: Developing a professional code of ethics in digital forensics. American Academy of Forensic Sciences (23 February 2016), Las Vegas, NE. K. Miller. Robots and Innovation. Invited talk at the College School (14 January 2016), Webster Grove, MO. C. Valenta, K. Miller, and E. Choklek. STEM + Architecture = STEAM (6 January 2016), St. Louis, MO. K. Miller. Learning to live with sophisticated machines. UMSL “What’s Current Wednesdays” (2 December 2015), St. Louis, MO. M. Lemke, K. Miller, and M. Miller. Pedagogy online and pedagogy face to face… two windows on the same soul: people learning together. Keynote at Univ. of IL Springfield’s Technology and Teaching Day (7 October 2015), Springfield, IL. K. Miller. The Hoverboard Hoax. Saint Louis Science Center, “Back to the Future” First Friday Event (2 October 2015), St. Louis, MO. K. Miller, C. Clossum, L. Johnson, J. Doyle and N. Miller-Spielman. Robots in education exhibit. Grand Opening of UMSL CoE’s Collabitat (30 September 2015), St. Louis, MO. P. Boyd (Moderator), M. Keefer, K. Miller, and W. Siewert. Seeing Contemporary Issues Through an Ethical Lens: Panel Discussion. 10th Anniversary of the Center for Character and Citizenship (29 September 2015), St. Louis, MO. K. Miller. Judge and sponsor at The Pitch, a week-long summer program encouraging high school students to become entrepreneurs (27-31 July 2015), Univ. of MO-St. Louis, St. Louis, MO. A. Bell-Christian, C. Clossum and K. Miller. Robot Demos and Workshop. Bright Ideas Workshop (18 July 2015), St. Louis Science Center. G. Hardrict-Ewing and K. Miller. Robotics Demo and Workshop (22 April 2015), McNair Middle School, St. Louis, MO. A. Bell-Christian and K. Miller. Girls Tech at St. Louis Girls Inc. Demo (20 April 2015), Girls Inc., St. Louis, MO. A. Bell-Christian and K. Miller. Jurrasic Hack Demonstration and Exhibit (3 April 2015), Saint Louis Science Center, St. Louis, MO. K. Miller. The future of human/robot interactions (26 March 2015), Annual Gordon Lecture, Denison Univ., Granville, Ohio. K. Miller. Five guest lectures at Denison Univ. (26-27 March 2015), Granville, OH. K.Miller. Member of the St. Louis Rotary Club Ethics Panel (25 February 2015). St. Louis, MO. Angela Coker and Counseling students present at the Third International Conference on Counselling, Psychotherapy and Wellness in Bangalore, India. 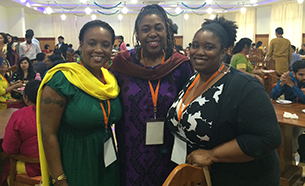 Pictured in Attached Photo: Tosha Pearson-Royston, Angela D. Coker, and Meaghan Lakes. This three-study investigation study of high school and college athletes was undertaken to develop, validate, and test the Contesting Orientation Scale (COS), a new measure designed to assess individuals’ tendencies to use contest-is-partnership and contest-is-war conceptual metaphors (i.e., contesting orientations) when competing. Results demonstrated that the measure adds significantly to existing measures in the prediction of sportspersonship. Over the past year, I’ve been involved in several presentations/panels focusing on cultural competence. In light of the events in Ferguson in 2014, I’ve made presentations at the NCAA Inclusion Forum, LaJolla, CA; the Great Lakes Valley Conference, St. Louis, MO; and Men4Men, an association of the male student-athletes in the Mizzou Athletic Program, Columbia, MO. 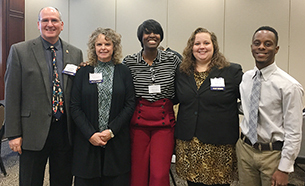 In collaboration with Dr. Jill Johnson, an UMSL alumna and an adjunct professor, and three graduate candidates—Nicole Jones, Ashley Link, and Paul Brown—from the UMSL School Psychology Program, our team conducted a workshop at the annual meeting of the Missouri Association of School Psychologists, Columbia, MO, in October 2015. We will conduct a similar workshop in February 2016 at the annual meeting of the National Association of School Psychologists, New Orleans, LA. The primary purpose of these presentations and workshops is (a) to increase awareness of participants’ cultural identity and (b) expand knowledge of research-based practices for delivering culturally-sensitive, psychological services. Bahr, M. W. (2015, May). Thoughts on Ferguson and Beyond. Presentation made to the Great Lakes Valley Conference, Spring Meeting, St. Louis, MO. Bahr, M. W. (2015, April). Thoughts on Ferguson and Beyond. In D. D. Kelly, Why is race so difficult to discuss? Invited presentation made at the NCAA Inclusion Forum, La Jolla, CA. Bahr, M. W. (2015, April). Discussions on race and diversity. Invited roundtable discussion leader at the NCAA Inclusion Forum, La Jolla, CA. Bahr, M. W., Dache-Gerbino, A., & Young, D. (2015, October). Why are race and racism so hard to talk about? Invited panelist for the MEN4MEN, Males Student-Athletes, Mizzou Athletics, University of Missouri, Columbia, MO. Bahr, M. W., Johnson, J. L., Jones, N. C., Link, A., & Brown, P. (2016, February). What School Psychologists Have Learned from Ferguson and Beyond. Workshop to be presented at the annual meeting of the National Association of School Psychologists, New Orleans, LA. Bahr, M. W., Johnson, J. L., Jones, N. C., Link, A., & Brown, P. (2015, October). It’s Important to Talk about Race: What School Psychologists Have Learned from Ferguson and Beyond. Workshop presented at the annual meeting of the Missouri Association of School Psychologists, Columbia, MO. In this ethnographic study we report findings from a study of data records collected from my 3rd and 4th grade classroom in 2001-2003. We argue that what comes to count as the Next Generation Science Standards and Learning Progressions is a socially and discursively constructed phenomena enacted by a dialogic interplay between a teacher’s pedagogical and epistemological understandings. We theorize in-school and out-of-school settings as Cultural Landscapes for Learning and thus require students to develop science literacy practices, ones integrated with reading and writing practices, in order to harness the science learning in the world around them. We demonstrate that science competency is not a ‘state of grace’ or something one suddenly arrives at. Rather, becoming a scientist and developing scientific literacy is an overtime process beginning at birth, and shaped by the intentional experiences afforded in and out of school. I completed 80% of the analysis and writing, whereas Balcerzak completed 20% of the analysis and writing. Spielman, J. Craig, C. Gorka, and K. Miller. Case Complexity and Quality Attestation for Clinical Ethics Consultants, Journal of Clinical Ethics, Vol. 26, No. 3 (2015), 231-240. Abstract: A proposal by the American Society for Bioethics and Humanities (ASBH) to identify individuals who are qualified to perform ethics consultations neglects case complexity in candidates’ portfolios. To protect patients and healthcare organizations, and to be fair to candidates, a minimum case complexity level must be clearly and publicly articulated. This proof-of-concept study supports the feasibility of assessing case complexity. Using text analytics, we developed a complexity scoring system, and retrospectively analyzed more than 500 ethics summaries of consults performed at an academic medical center during 2013. We demonstrate its use with seven case summaries that range in complexity from uncomplicated to very complicated. We encourage the ASBH to require a minimum level of case complexity, and recommend that attestation portfolios include several cases of moderate complexity and at least one very complex case. Grodzinsky, K. Miller, and M. Wolf. Developing automated deceptions and the impact on trust. Philosophy & Technology. Vol. 28, No. 1 (2015), 91-105. Abstract: As software developers design artificial agents (AAs), they often have to wrestle with complex issues, issues that have philosophical and ethical importance. This paper addresses two key questions at the intersection of philosophy and technology: What is deception? And when is it permissible for the developer of a computer artifact to be deceptive in the artifact’s development? While exploring these questions from the perspective of a software developer, we examine the relationship of deception and trust. Are developers using deception to gain our trust? Is trust generated through technological “enchantment” warranted? Next, we investigate more complex questions of how deception that involves AAs differs from deception that only involves humans. Finally, we analyze the role and responsibility of developers in trust situations that involve both humans and AAs. The workshops were refereed proposals that were accepted for state and national school psychology conferences. The goals of this work, whether an invited presentation or a workshop presented by my team, are (1) to raise awareness of identity development and (2) to provide resources on culturally-competent practices. Bahr, M. W., Dache-Gerbino, A., & Young, D. (2015, October). Why are race and racism so hard to talk about? Invited panelist for the MEN4MEN, Male Student-Athletes, Mizzou Athletics, University of Missouri, Columbia, MO.